Goes Anywhere Perfectly: This impressive design is not just for the nursery or home. Use it in the kitchen, bathroom, office, bedroom, entryway, or living room. You can utilize all 4 on one wall space, or use each one individually in different rooms. Countless Purposes for the Curios One: You can add color and organize with style; these shelves will work anywhere perfectly. books, collectibles, mementos, awards, trophies, record albums, magazines and so much more. Great Gift Idea for the Holidays: Give someone special a multipurpose gift this holiday. Get it for a housewarming, Christmas, New Year's or just because. Order in the comfort of your home while supplies last, and have it delivered to your doorsteps. and get things off the floor by storing books, toys, collectibles, etc. solid and sturdy on the shelves. Each Shelf's Dimensions: L 17 3/8" x W 4" x H 3"
Quick and Easy Installation: Each shelf comes fully assembled with all the necessary hardware to make wall installation as convenient as possible for you. You don't need a professional set of hands with the purchase of these shelves. 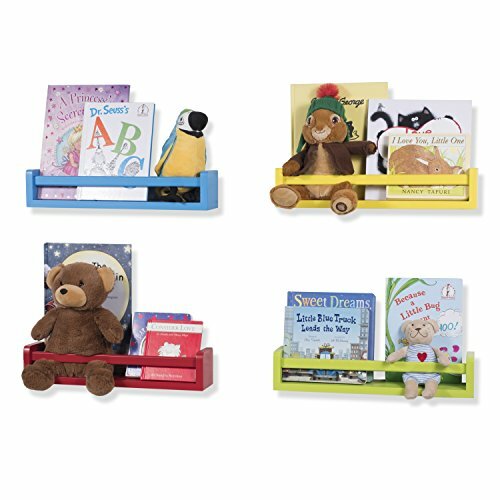 Made with Good Craftsmanship: These wooden book shelves are made with sturdy and solid wood material, so each L 17 3/8" x W 4" x H 3" ledge designed shelf can last you a lifetime, and you can easily keep adding to your wall as your child's book collection grows. Great for the Baby Monitor Camera: Keep your nursery room decorative and looking streamlined with your baby at view all the time. You can easily install this shelf at angle view above your crib, so keeping an eye on your baby even at sleep will be hassle-free. Encourage Early Childhood Reading: Each shelf has a unique front rail to keep books intact, so nothing falls forward or off the shelves. Create a reading corner with ease to keep your child's favorite books at display all the time. Create a Beautiful Display of Collectibles: These shelves are not just for books, each one is great for storing plush toys, blocks, Barbie dolls, Disney's Frozen, Harry Potter figurines, or other Funko Pop characters. If you have any questions about this product by Brightmaison, contact us by completing and submitting the form below. If you are looking for a specif part number, please include it with your message.